Totally new possibilities for product design are now available for Touratech’s developers, thanks to the forming technology of hydroforming; the pilot system of which already produces new parts with pioneering properties. Two thousand bar of water pressure does not even exist in the darkest regions of the ocean deep. In the Upper Bavarian city of Murnau, such values are on the daily agenda – even though it’s located above sea level. This extreme pressure is reached thanks to the brand-new hydroforming machines at TT-3Ds. The term hydroforming refers to a still young technology. Simply put, with this forming method, a plate is pressed against the wall of a mould by extremely high water pressure and thus exactly replicates its morphology. Unlike the deep-drawing technology, you just need one tool for hydroforming. “Furthermore, we can achieve almost infinitely small radii,” Dirk Bendl, the manager in Murnau explains. 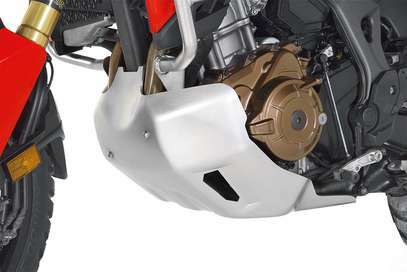 A good example of gain in functionality is the hydroformed engine guard for the latest generation of the BMW R 1200 GS. “With classical constructions featuring trimmed and welded aluminium elements, manifolds must be omitted, but in this new single-piece engine guard they are included, thanks to its detailed shaping. “This fact ensures much more protection, because in especially hot conditions the manifolds are very sensitive to stone chips,” Bendl adds. With hydroforming, stainless steel can be processed just as aluminium or simple sheet steel. As a result, there are numerous fields of application. “Crucial for us is the fact that due to the almost unlimited shaping options, we can meet specific requirements even better. In contrast to the well-known tube hydroforming (i.e. two welded sheet metal parts are widened by water pressure from the inside to be turned into a tubular part – two-stroke exhausts are a familiar application), sheet hydroforming enables TT-3D to create complex shapes with precise repeatability. However, this requires a lot of expertise. “Sheet hydroforming is still a young technology. There are almost no universal experiences. In many fields we do pioneering work,” Dirk Bendl points out. Especially the cutting and the preparation of the plate to be inserted into the machine is a big challenge for the developers. Only if the plate is dimensioned perfectly, material can flow out of the flange section during the forming process in the precise amount required. Thus, Touratech has every work step from design up to the toolmaking, the forming itself and further processing under one roof. However, the final processing does not take place at TT-3D in Murnau, but in Niedereschach, Germany. There are the 3D-laser devices giving the primary product its final shape, by cutting out apertures and screw holes. However, compared to conventional procedures, with hydroforming one work step can be saved: the surface finishing afterwards. Even delicately brushed plates withstand the reshaping with unscathed surface. “That does not mean, of course, that we have to go without a further refinement of the hydroformed parts,” Bendl adds. 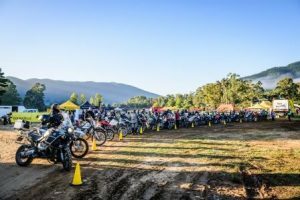 Not necessarily with 2000 bar, but in any case with high pressure Touratech and its sister company, TT-3D, are working on even better motorcycle accessories by using the latest technology. “There will be some more innovations in the field of hydroforming in the course of this year,” Bendl indicates with a cheeky smile.